Tattoos are meant to be permanent, but there are still a few methods for removal or concealment. (Health.com) -- Getting that tattoo seemed like a good idea at the time. But now that blast from the past on your back or tribal band around your arm may seem like a bit of body art you could live without. If you're ready to get a tattoo removed, you're not alone: According to a 2006 survey in the Journal of the American Academy of Dermatology, 24 percent of 18- to 50-year-olds have tattoos, and 17 percent have considered tattoo removal. There's good news and bad news when it comes to getting a tattoo removed. The bad news is that tattoos are meant to be permanent, and even state-of-the-art removal techniques won't work for everyone; your chance of success varies with your skin color and the tattoo's pigments and size. The good news is that you don't have to undergo your mother's tattoo removal technique. The de-inking process has evolved in recent years, from a cringe-worthy, potentially skin-damaging process to a safer, more sophisticated method that uses laser technology. In decades past, people trying to get rid of tattoos have gone to extreme measures to de-ink. For example, one technique known as dermabrasion involves scraping away or sanding down the skin. In salabrasion, a salt solution is rubbed into the skin and heated and scraped away. In both cases, when the area heals, the tattoo may be gone, but scars are likely to be left behind. Surgically removing the tattoo is also likely to leave a scar. The tattooed skin is cut out and the surrounding skin is sewn back together. Occasionally, doctors can perform surgical removals of tiny tattoos. Scars are the most common side effect of tattoo removal. However, for some, the removal technique known as scarification is a form of body modification itself, just like tattooing and piercing. Much like a chemical peel removes the top layer of skin, an acid solution is used to remove the tattoo in this procedure. The scar that forms in its place covers up whatever ink remains. Cryosurgery, sometimes called cryotherapy, has also been used to remove tattoos. This procedure freeze-burns the tattooed skin with liquid nitrogen, which is commonly used to treat warts and other skin lesions. 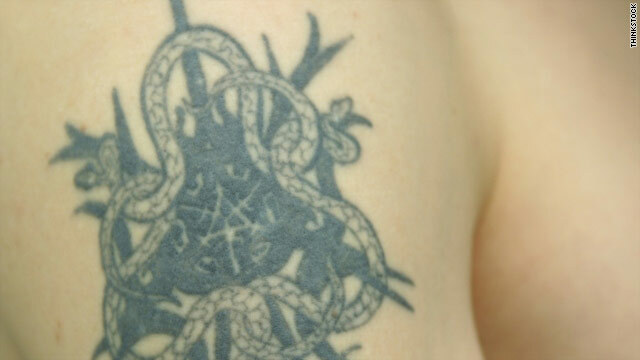 None of the above forms of destroying the tattooed skin are recommended, says Dr. Paul Jarrod Frank, M.D., the founder and director of 5th Avenue Dermatology Surgery and Laser Center, in New York City. "You could throw kerosene on it and light a match -- that'd be the same thing." The best way to remove a tattoo is with quality-switched, or Q-switched, lasers, which have become widely used in the last decade. The beam of light searches for contrast between skin tone and ink and pulses intensely on the skin to break the ink down into particles small enough for the body to absorb. "Laser removal is the standard of care," says Frank, but that doesn't mean it's foolproof. "There is no great treatment." Laser treatment works differently for all patients, depending on the tattoo. The greater the color contrast between the ink and skin, the easier the removal will be, says Frank. Black ink on light-skinned people, for example, is the easiest to remove, while fluorescent colors -- green and purple, in particular -- are nearly impossible to erase. "Patients with tattoos with those colors, I actually try to convince them not to remove it, unless they just want to fade it enough to cover it up with another tattoo," Frank says. Smaller tattoos are also easier to remove, as are older tattoos, because the ink is easier to break down. Taking those factors into consideration, patients should expect to undergo five to 12 laser treatment sessions, according to Frank. You will need to wait a month between treatments, so expect the process to last six months to a year. For Tricia R., 24, the road is a long one. In May 2009, she consulted a plastic surgeon in Indianapolis, Indiana, about removing a tattoo she got at age 19 on her lower back. "As I became involved in various activities and organizations at college, I began to realize that my 'tramp stamp' was a huge mistake," she says. "I wasn't proud of my decision and wanted to hide it." Her doctor estimated she would need 20 laser sessions -- more than most people, due to the multiple colors in the tattoo. The entire procedure will cost a couple of thousand dollars, she says. Laser removal can be painful, and for the first few days after the procedure the treated skin looks like a healing burn. "I don't know what hell is like, but during my treatments, I would swear that's where I am," says Tricia, now on her sixth session. "I immediately felt like I was being pelted with hot grease and flicked with rubber bands. It by far is the worst pain I have ever felt in my entire life. On top of the pain, the noise of the laser burning my skin is similar to the noise of bacon frying in a skillet." Patients should care for the skin like a burn too, applying antibiotic ointment and keeping the skin bandaged, Frank says. Compared with older treatments, laser removal leaves little to no scarring, but it may cause allergic reactions in some people. In some cases, the skin around the tattooed area can become discolored or infected, and it is important to shield this vulnerable skin with sunscreen. Any scarring or discoloration should be limited to that area, though. "Lasers can target [tattoo ink] without destroying things you want to leave alone, like healthy skin," Frank explains. Since treatment sessions add up, the cost of laser removal isn't so forgiving on bank accounts. Each session with Frank costs $350. Since a small tattoo is typically $80 to $100, the cost of removal often far exceeds the price tag of the original ink. "Despite the pain, time, and cost, I am confident that it will be well worth it when I can look in the mirror and no longer see the evidence of a big regret," Tricia says. If you're not ready to spring for laser treatments, heavy-duty makeup kits could do the trick. Companies like Tattoo Camo and Tattoo Cosmetics sell cover-up kits. Even mainstream cosmetics companies, like Dermablend, carry products that may be effective in hiding tattoos. Many websites and infomercials sell over-the-counter tattoo-fading creams, such as Tat B Gone and Tattoo-OFF. Tat B Gone touts removal in three to nine months; a six-month supply sets a patient back about $270. The sales pitch is enticing: The creams are easy to use and relatively inexpensive. But the Food and Drug Administration says not to try do-it-yourself products, as they may cause skin reactions. The ingredients active in the fading process are chemical irritants meant to erode the skin, says Frank. The hope is that the body's natural healing processes will dissolve some of the ink as it heals the area, he says. Whatever technique you use, if you're not happy with the residual coloration or scarring, you could try one more thing -- another tattoo. Depending on the design, shape, and location, a skilled tattoo artist may be able to incorporate an old tattoo into a new design. Unlike other methods, getting another tattoo -- and to a lesser extent, laser removal -- is the only procedure that guarantees results. If there were other methods that worked, says Frank, "I wouldn't need a $150,000 laser!